Laced through my Facebook feed this year have been pictures and links to a portable fish finder that you use with your smart phone. Many of the sharers have asked if I had seen it, tested it or had thoughts on it and until recently my answer had been no. Now, thanks to Dean over at Tightlines Premium Fishing Tackle in Killeen, TX, I do have some thoughts on it. 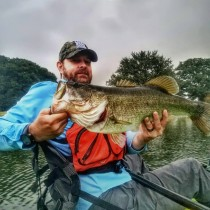 FishHunter is a completely portable smartphone fish finder that measures water depth and surface water temperature as it works to pinpoint fish. Manufactured with military grade specifications, the downward facing sonar transducer is securely wrapped inside a sealed, waterproof rubber ball the size of a baseball. Using a high frequency transducer the FishHunter fish finder provides superior resolution and accuracy in all marine weather conditions. The Fish Hunter is pretty easy to use. The app downloads quickly and has instructions built into it. One note, make sure the transducer is in water or it won’t pair with your Bluetooth. After I read the instructions and figured that out, it was a breeze. The app has several features including GPS pin drops, taking and sharing pictures to a social feed, and a recorder. The recorder takes a snap shot every minute and adds to your gallery so you can go back and scroll through the different spots on your trips. It also adds a GPS tag to them. The Fish Hunter is a combination of a fish finder and an app like Fishing Scout. For some reason I thought the unit would sink. Other cast and view fish finders I have seen did that but this one floats. That relieves some of the stress about casting it off of your line. It is also bright orange so if you do cast it off you can find it. Overall it has a lot of nice features. I was able to mark the bottom, fish and it operated about the same as a 83khz color fish finder. As for the operation of the Fish Hunter, I wish there were a few more tweaks you could do to change surface clutter, ping speed etc. I do however realize it is a castable unit so options will be more limited. The biggest gripe about the Fish Hunter is the price. With a normal MSRP of $229, this is not a reasonable option for most kayakers or power boaters. I bought a Lowrance Elite4- HDI for less than $229 with a Lake Insight chip brand new. Add in the cost of the battery and it’s the same. That being said, if you were a pond fisherman or ice fisherman, this could work pretty well. I’m not sure how many pond guys want to see the fish and depth that badly but if they did, it is a viable option. This is a cool tool that can be used by a certain niche market. Kayakers and power boaters should probably look elsewhere to get more bang for your buck. For bank and ice guys, this could be a good one. The social sharing, recording and GPS mapping are nice touches. If this unit were $99 instead of $229, this would be a different conversation. Looks to be a good idea for ice fishing, which I do a lot of. There is another similar gadget out there called Deeper also.